We are starting to see some subtle changes in market behavior but the trend currently remains down for both gold and silver. For those who want to grow their capital, the best time to make a market commitment is with the trend and given how no one knows how the market will correct, it is best to wait and see first what the market reveals. Below are some daily and weekly charts on gold & silver charts to show you how things are developing. So says Michael Noonan (edgetraderplus.com) in edited excerpts from his original article* entitled Gold And Silver – Chart Reading More Accurately Depicts Fundamentals/Technicals. It is absurd to “predict” any future market action. The future has not yet happened. The only aspects about the market of which we are certain is that anything can happen, at any time. Every trade potential is a unique event. Markets may appear similar, but the players in the current market are very different than the ones from a similar past situation. How price will develop into the future is unknown and cannot be known in advance. The market is based on probabilities, outcomes that are likely to occur, and however likely they are to occur, no one can know how they will unfold. You have a history from the past two years of endless predictions on where the prices of gold and silver would be. We have not kept a scorecard on the silliness of how wrong so much respected talent, and lesser, varying degrees of not so much talent that have totally missed the mark. There are 2 different approaches to supposedly understanding the market, fundamental analysis & technical analysis and variations thereof, What are we? 1. We are not fundamentalists, at all, with emphasis on at all. Fundamentals are an attempt to discover and measure the factors of supply and demand. The biggest problem with any such analysis is one of timing. There is none. The other issue is the degree of awareness of which fundamentals are the biggest drivers; some may not be known or even recognized, leaving any such analysis incomplete. Admittedly, we know nothing about fundamentals, by choice. What we know of them is that they are fully incorporated into the charts by those who know what they know and ultimately make a decision to act upon that knowledge. That action gets translated into price and volume. It matters not if it is widely known information, insider information, market manipulation, what have you. It has to show up in executed price and be a part of total volume. Once information enters the market in price and volume, it is a “got ya” moment. 2. Nor are we technicians, as most technical analysts, (TA), are. TA rely upon a few or several technical tools as a means of interpreting the markets, such as RSI, Bollinger Bands, MACD, moving averages, (even used by fundamentalists, to a degree), trend lines, overbought/oversold indicators, etc, etc. With commonly recognized technical analysis, every tool is a derivative of price and volume. Derived technical tools are all attempts to impose past tense market information onto the present tense in an effort to “predict” the future tense. 3. In our analyses of gold and silver we simply choose to focus on the purity of the information in its original format. We use, exclusively, a combination of price and volume and read within the context of the prevailing trend, for whatever time frame, be it monthly, weekly, daily or intra-day. The range of a bar tells the ease, or lack of market movement. The location of the close says who won the battle between buyers and sellers. When volume is added into the mix, the market begins to take on life, of sorts, that fleshes out the actual ebb and flow of the tug-o-war between the opposing forces of supply and demand. Price is knocking on the down trend door in gold, but that does not mean it is knocking that door down. It takes time to turn a trend. We show gold testing a small 50% range. There are two higher half-way points that price has yet to approach, so despite a decent rally, last week, the trend has not turned. How gold corrects lower over the next week or two may well provide some important trend information. Given how no one knows how the market will correct, it is best to wait and see what the market reveals, first. The daily shows in detail why gold was expected, (not predicted), to run into resistance at the 1260 – 1270 area. Always think of support or resistance as a price area and not just an absolute number. Thursday’s wide range, high volume bar was likely a combination of short covering and maybe some new buying. What will be key to watch is how price retraces this last rally effort. If the market intends to go higher, the next correction will have smaller ranges and lighter volume, indicating less selling pressure. If price corrects on increased volume and wider ranges with weak closes lower, then the down trend will remain intact. Silver acts differently than gold. It is clear that the trend remains lower with no sign of buyers taking control. A picture of 1,000 words to which we need not add. Silver has work to do to turn the trend around. Looking at the daily chart, in some ways it would not take much effort to end the down trend. 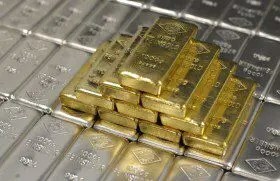 There are no guarantees that physical silver and gold will continue to be available at current prices, maybe not even at any price until it adjusts to a higher level. That is the risk everyone who want to buy coins and bars takes, while waiting or trying to get a better price or simply trying to outguess the market. Will you catch the bottom? No, (care to guess how may have tried and succeeded in the past few years?0 but if you can consistently catch profitable trades, with the trend as it develops for at least many months and more, does that not make plain common sense? 1. Noonan on Silver: Wait for Price to Confirm Its Intent – Then Start Stacking! 2. Noonan: The Trend in Gold Remains Down – But For How Long? 10. Growth In National Debt Is 86% Correlated to the Price of Gold! Got Gold? Next Is a Real Estate Bust Coming to Canada – Finally? Despite what happens to China’s market on 01/31/14, sooner or later some event will start an avalanche of sell orders that our super fact computers will be only too happy to execute, while at the same time everyone will be trying to reposition their assets in order to profit from the skyrocketing value of PM’s, causing a global PM shortage which will only make PM’s value rise even higher. I believe we will also see many market closed for extended periods as Governments and their Central Banks struggle to convince their investors that the issuance of ever more paper money will somehow provide a safe haven until things settle down.